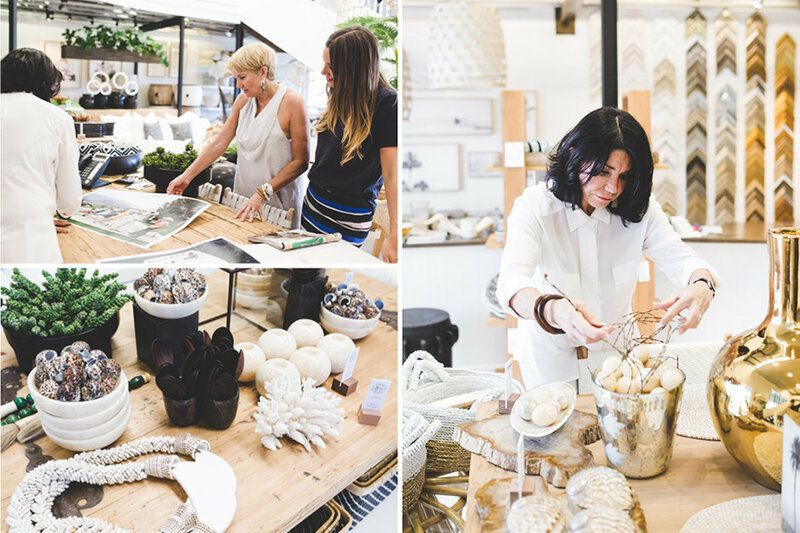 The Gold Coast has been good to long time entrepreneurs Jasmine Smith and Leanne Pearce who have seen both hard work and a love of fine art bring them good fortune in many forms. Over the years I’ve had the pleasure of being able to wander into St Barts and pick up gorgeous high quality pieces. 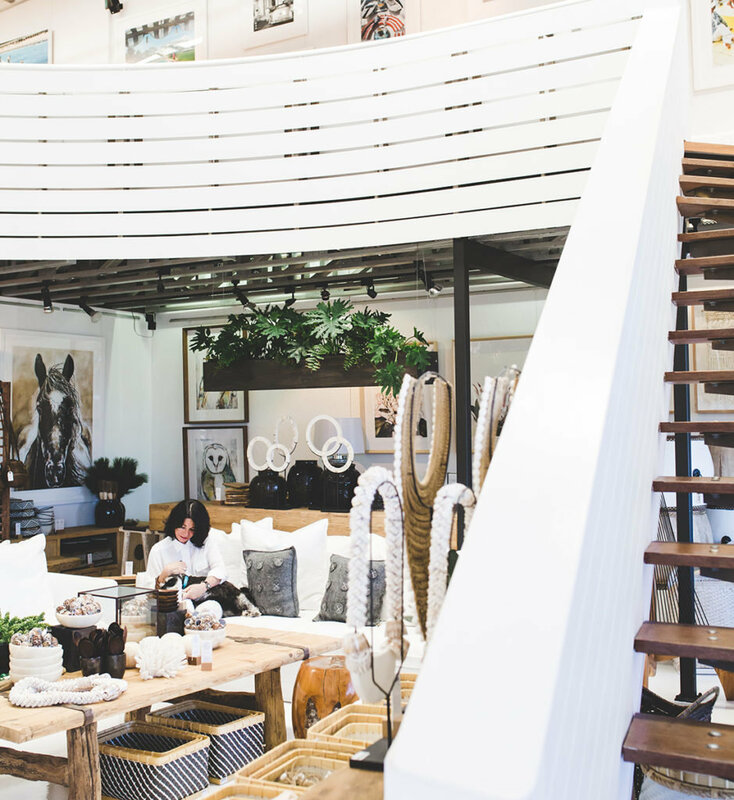 Like many other great businesses on the coast taking a fresh approach and making amazing things accessible I was curious to know the story behind their beautiful space. I caught up with Jasmine and Leanne to learn more about their background and how the illustrious St Barts came about. 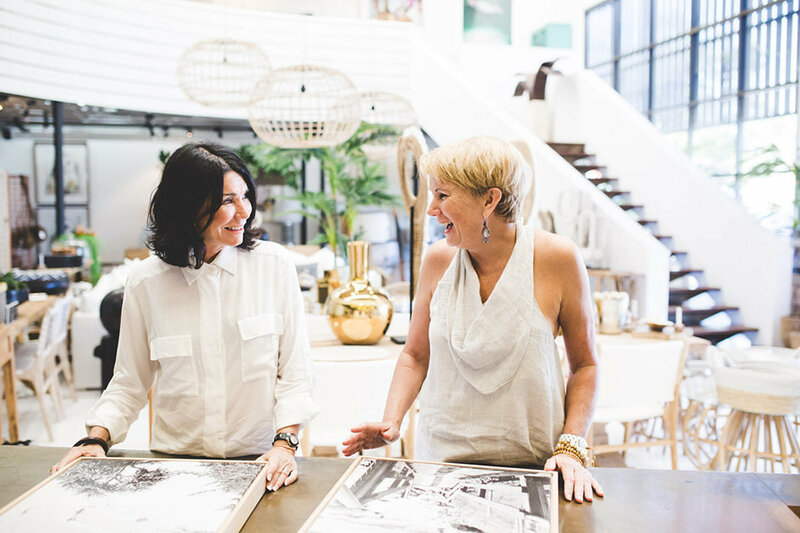 Curators of a distinctive textiles and homewares collection, Jasmine and Leanne’s friendly, relaxed approach to work and life is evident both in person and by reputation. They have the utmost respect for one another, and for the talents of their team. If you haven’t ever been into St Barts, what you’ll find is a celebration of treasures from around the globe that meld together, evoking a timeless sense of travel and adventure. Homewares, art, clothing, gifts, linen and furniture. Each season brings a new collection of it’s own individual flair but they all seem to share a sense of quiet elegance, restraint and just a touch of luxe! 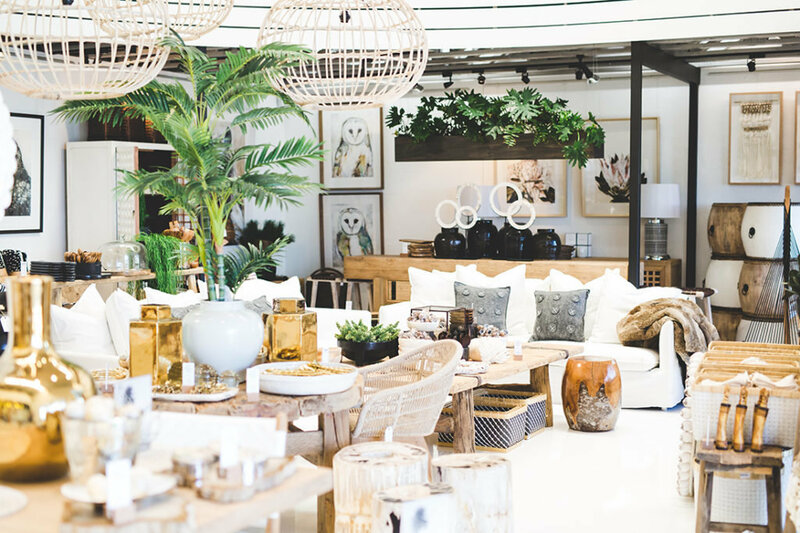 At two locations on the coast, the Brickworks, Ferry Road in Southport and their showroom at Kortum Drive, Burleigh Heads (photographed). From humble beginnings, to supporting communities and thriving in the arts sector. Meet Jasmine Smith and Leanne Pearce. Thank you! Art and art culture wasn’t something necessarily inherited, rather something that must be deeply in our psyche. We never intended to have careers in the art world however as our love for art and design evolved, our businesses did too. We suppose it is our destiny. Visiting art galleries and museums throughout the world and appreciating art has always been something we’ve enjoyed. We see ourselves as quiet achievers who just get in and do what we love to do. The arts really inform our business, if not for art, what for? You have a major history on the Gold Coast in the arts sector. How has that played into your careers and passions? Where did you begin your journey in the arts? What was the catalyst for starting out on this adventure together? Our story begins some time ago, in 1986 (!) Leanne had been living in Sydney for 5 years and I (Jasmine) was on the Gold Coast with my own cane furniture business. I dreamt about opening a business in the arts. An unfortunate illness in the family brought Leanne back to the Gold Coast where she grew up and her family resided. We had been friends and over drinks we discussed opening an ‘art business’ on the coast. Soon after, we opened stores called ‘Picture This’, a new to QLD innovative concept of “do-it yourself framing” within the stores that was surprisingly well received. We worked hard and put all profits back into the business. We made mistakes but we learnt from them and continued to grow. What’s your own style? Does it transfer into all areas of your life? Our style at St Barts is who are at home, relaxed! We say we love horizontal spaces! Jas was a hippy in her day but always loved beautiful exotic things. She inherited this from her father. Is there a favourite space you each love in your homes? How is it styled, how does it make you feel? What’s the key piece that ties it all together? For me, (Leanne) the deck by the beach as I love to entertain. For Jas it would be the media room with the bookcase filled with thousands of books, perfect place to curl up in front of the fire and unwind. You seem to have a deep connection with giving back to the community – what does this journey look like for you at the moment? We have been very blessed in our lives and we often talk about and reflect on the different ‘seasons in our lives’. A season that particularly brought gratitude and the desire to ‘give back’ was coming out of the GFC with two successful businesses. We were so grateful and wanted to play our small part in creating good in the world around us. For the last 2 years we have supported a women’s group in the local area and have held an art auction at the Mayoral chambers to raise money for disadvantaged youth through Radfly. We raised in the vicinity of $60k each year for Ohana for Youth and Yhes House. Deep in our soul this has given us great joy. What is your advice for living the simple life in the most sophisticated way? We work hard so the most simple things are greatly appreciated. So we would suggest gratitude for the little things, a walk on the beach with our dogs, a barbecue with family and friends, but always with a nice wine! 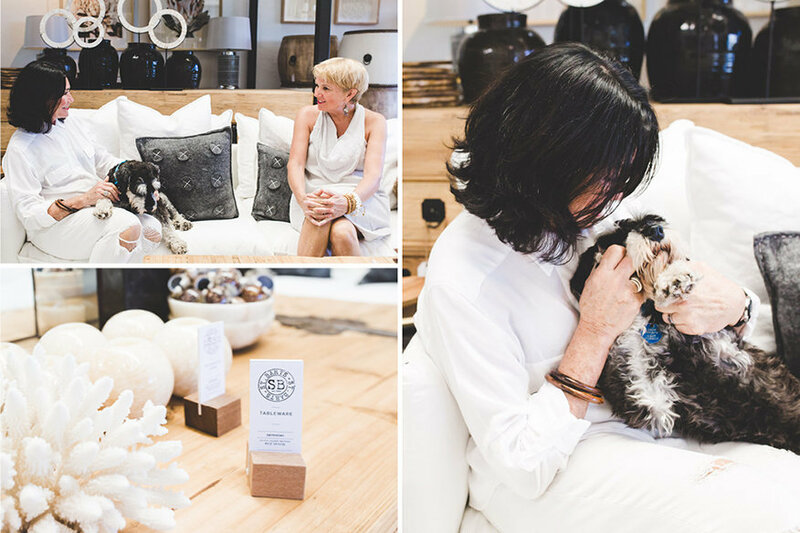 What ’s the story behind going from a successful art curator to retail entrepreneur & have you learnt any hard lessons along the way? We have always known retail and business through art so the transition has been fluid. We have always worked hard. We have always stuck together like glue to make things work. That is not to say we don’t argue a point! I (Leanne) have always thought up ideas and Jas has had to pick up the pieces. One particular hard lesson I recall was in 2000. The Olympics were in Sydney and I worked hard to secure the rights to create limited edition paintings of the Olympic athletes. Grant Hacket, Susie O’neil, Ian Thorpe, Cathy Freeman etc. We failed miserably and lost a lot of money, but we moved on. St Barts came out of the GFC. We had and still do have our core business Corporate Art which supplies artwork to hotels and resorts. We had a large project in Abu Dhabi that was coming to a close and commercial projects were winding down. However we had a great creative team and we felt committed to keep everyone employed as we were like a family. Karen (who now manages Gallery One) and I took flowers to Winn Schubert when she closed her iconic Schubert gallery. Soon after this she invited us to have coffee and said it was ‘our time’ to open a high end gallery and there was a vacancy at the Brickworks. Jas said ‘well if you are going to open a gallery we should open a lifestyle store as well!’ From there we met with “the boys” from Brickworks who immediately saw our vision and Gallery One and St Barts were born over coffee and a dream. 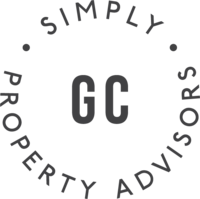 We had opened two businesses in the GFC! Rocks in our head? No, just a driving ambition to succeed and a great team behind us! The aesthetic in all of your collections is time less & melds so many styles. How do you approach each collection & combine your tastes? The collections are rarely planned, rather they just evolve from what I (Jasmine) discover, we like to have fun with it. We might have a wish list of what we would love to source that would compliment our current range, but when you are travelling weird and wonderful things present themselves and it sometimes just works! The ethos of St Barts is about carefully collected and created pieces from global travels to unearth a sense of wanderlust and adventure within the home, and this ‘global’ aspect helps keep us timeless. Describe what each of your work spaces looks like? Our work spaces are typically creative and a mess! We endeavour to try and go paperless but sometimes you just need to spread things out. How much of the year do you spend travelling, curating and discovering new pieces? More than what you would think! In one year, we visited Morocco, Singapore, China twice, Jakarta twice, and Bali twice, and those are primarily sourcing trips for St Barts! 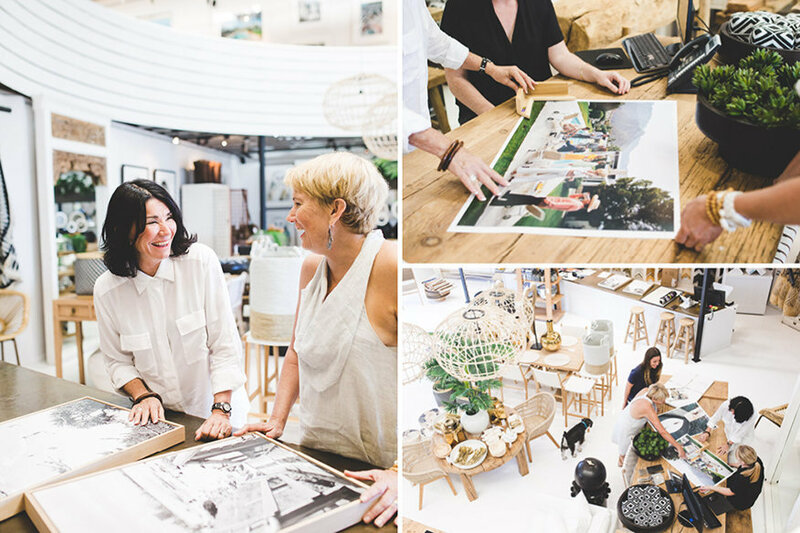 Through Corporate Art we visit art fairs around the world and travel for inspiration and meetings. Leanne is currently working on The Star in Sydney, and is there almost fortnightly. More recently in January we visited our namesake St Barths and it was everything we expected and more! Can you give me a couple of key pieces in store this summer that you’re loving and why? The oversize planters cut from the base of a palm tree, hand carved and painted in white. I love these for their Caribbean feel. Hand carved Fossil birds made from 1000 year old fossil makes for great conversation. On our travels we sourced some amazing verdigre copper mermaid sculptures that paired beautifully with our recycled elm tables and consoles. And of course our range of panama and straw hats, a must for Summer! What’s your favourite part of the gold coast? 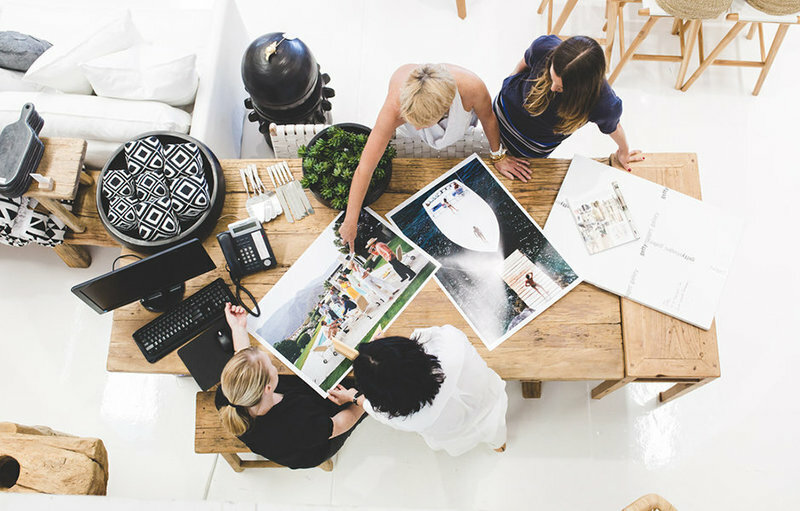 Our head office is at Burleigh and we love how it has developed into an innovative creative hub. However we are loving the quiet beaches at the southern end of the coast since relocating there five years ago. Being able to drive to work with no traffic lights is a bonus! Paint a picture of what the arts & cultural scene is like on the gold coast. It’s refreshing and exciting to see the Gold Coast arts scene finally getting national recognition and receiving state government funding to boost the arts and cultural scene. Corporate Art has been a part of the conversation for developing research and the outcomes of the direction of the arts scene on the Coast, and will continue to support emerging artists through such programs as Radfly Emerging Art Awards and showcasing local emerging artists through various Corporate Art projects. What’s the business vibe like on the gold coast? You’re in a neat little creative hub in the brickworks, what attracted you to that area? I think business is improving on the Coast. There are cranes in the air, the prices of real estate are coming up and there is growing optimism and an excitement around new business. You’ve been on the coast for nearly 30 years – apart from the weather and our stunning beaches what keeps you here? This is our home, this is where our heart and our family is. We may travel a lot but it is always so good to come home and breathe in the fresh air. We appreciate life here constantly, it is a wonderful place to live. I remember someone saying many years ago that there is a sub culture on the Gold Coast of really good people that are socially conscious, that are real people. When the Coast is represented as superficial, it couldn’t be further from the truth.